New York, NY (WiredPRNews.com) The Japan Foundation’s Center for Global Partnership (CGP), is an organization whose mission is to promote communication and collaboration on the shared responsibilities of global welfare between Japan and the United States. Ironpaper is an interactive web agency whose mission is to find integrated website design solutions for, and in collaboration with, its clients needs. With compatible goals, these two companies produced a relationship and, most recently, launched a redesign of CGP’s website, they both are proud of. 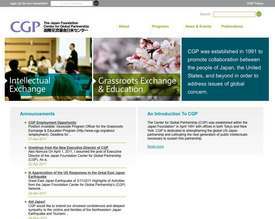 Ironpaper proposed to enhance CGP’s focus on dialogue and interchange by greater capabilities online, that was focused on accessibility and organization. By rebuilding their current website, this website design solution features a new look and feel, content management system and grant database, news and search engines, and analytics capabilities. With these features, CGP now has a simple and streamlined organizational tool which integrates marketing and social media outreach, as well as provides easier publishing tools, better branding and future scalability that will aid in the growth and visibility of the organization. The design is vibrant, easy to navigate, and immersive. Throughout the project, CGP and Ironpaper maintained frequent communication to find solutions and tweak the process together, keeping their shared goal in mind. CGP is passionate about their mission and Ironpaper was determined to assist CGP in delivering information about their fellowship and grant offerings, to further promote their intellectual and grassroots exchange. They now have a platform that is easy to use, comprehensible, and informative to their greater constituency.